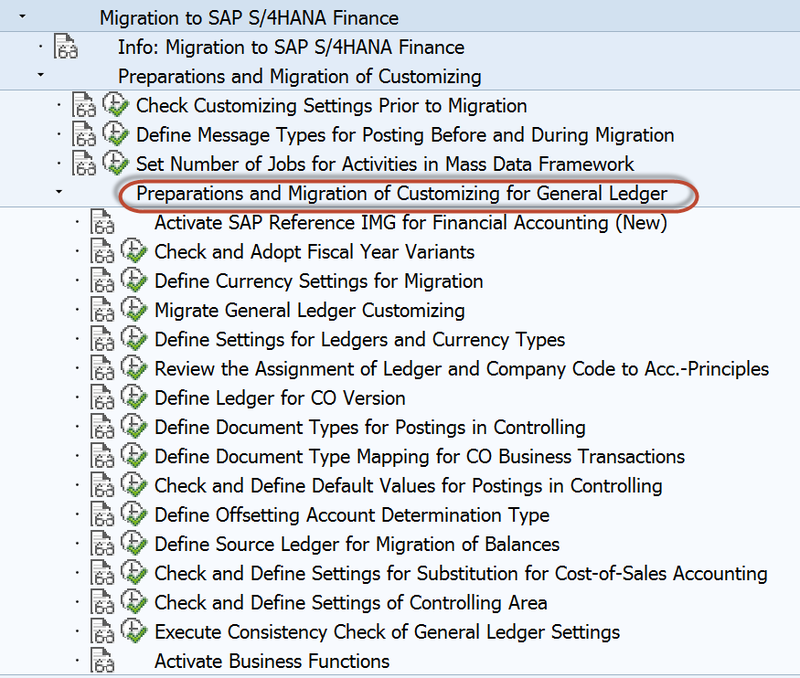 Welcome back to continuation of my blog on S4HANA Finance Migration – what’s on your plate ? In fact, my plate was full for past few weeks due to the ‘Go-Live’ of our S4HANA FIN migration project. Everything went smooth as expected and we are looking forward to the first period close after the migration – hoping for no surprises. We structured the precheck list as below on SAP documentation that is available along with other documents like Release Notes, Installation and Upgrade information. A detailed Migration guide is available at http://help.sap.com/sfin300. We updated the steps with relevant notes and specific comments. Hope these steps would prove useful to you as a quick reference. I will also go thru the Customizing, data migration and post migration steps. In fact, the S4HANA FIN 1605 provides enhances IMG activities with various consistency checks after the migration. There is now a Migration monitor (t-code FIN_MIG_STATUS) available that makes it easier to debug on specific errors and address more effectively. 2 Make sure that you have either posted or deleted all held documents. From SAP Note 1939592 , implement report RASFIN_MIGR_PRECHECK and test whether the necessary prerequisites for new Asset Accounting have been fulfilled using report RASFIN_MIGR_PRECHECK (Check on Prerequisites Before FI-AA Migration). If you discover when executing report RASFIN_MIGR_PRECHECK that currency areas are missing, you have to create these first in a separate project and have the system determine the values. 4 Check Business Function ‘EA-FIN’ is activated. Transaction SFW5 to activate business extensions and business functions. 6 Make sure that you have carried forward all of the balances in all applications to the current fiscal year. This also applies to the sub ledgers. Use the following transactions. THIS IS UTMOST IMPORTANT. You perform the following activities in your test system and if you are using classic General Ledger Accounting, new General Ledger Accounting or the Simple Finance add-on 1.0. Check whether the currency settings and the CO configuration in your system allow you to upgrade to SAP S/4HANA Finance. To do this, run report FINS_MIG_PRECHECK_CUST_SETTNGS. This report is found in SAP Note 2129306 . Execute report RFINDEX_NACC with the option Indexes vs Documents. You perform this activity if you are using classic General Ledger Accounting, new General Ledger Accounting, or the SAP Simple Finance add-on 1.0. Check documents against transaction figures for all fiscal years, in which archiving has not yet taken place. If you are using new General Ledger Accounting, execute the reconciliation for the general ledger and the sub ledgers. Use report TFC_COMPARE_VZ to do this or choose transaction FAGLF03. Reconciliation Program FI-AA <-> General Ledger: List with Difference Accounts (Report RAABST02). You use this report if you are using classic and new Asset Accounting. Consistency Check for FI-AA (New) and FI-GL (New) (Report RAABST01). You use this report if you are using classic Asset Accounting. Compare the ledgers if you are using new General Ledger Accounting. Use report RGUCOMP4 to do this or choose transaction GCAC. you perform this step if you are using new General Ledger Accounting. Reconcile Materials Management (MM) with GL. Choose report RM07MBST/ RM07MMFI to do this. You perform this step if you are using classic or new General Ledger Accounting. Check if you have write accesses to the tables in your own customer objects in your customer namespace. You have to replace these accesses, since the views with same names allow only read access. Check if you have your own customer-specific views in your own objects in your customer namespace for the tables that no longer exist. You have to replace these views with an open-SQL SELECT or the call of a read module, since the Data Dictionary does not support database views that are based on other views. If you are using new General Ledger Accounting and also using customer-defined fields, these fields are generated to the appropriate compatibility views. If a customer field exists in both BSEG and in the indexes, it is automatically generated into the view with the same name. It is not transferred into a view with the same name if the customer field only exists in the index. In this case the field must first be included in the BSEG and filled using a customer program. 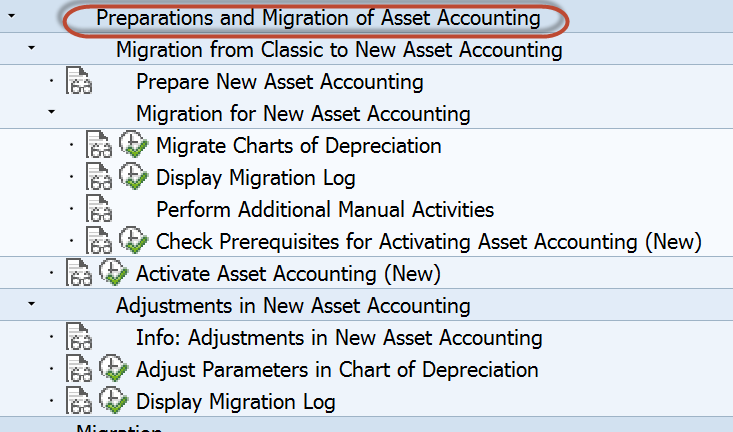 If you transferred data from your Z tables to new General Ledger Accounting during the migration to the Financial Accounting Add-On 1.0, you have to delete the data of these Z tables before the migration to SAP S/4HANA Finance, On-Premise-Edition. If you do not delete the data, the data of the Z tables is migrated again and transferred to the new table structure. The values would then be duplicated. If you have used interfaces to connect your system to external systems that make postings to General Ledger Accounting (in real time or subsequently), check whether adjustments need to be made to the interfaces. For more information, see FI-GL (New), Transfer of Totals and Single Documents in Distributed Systems. In SAP S/4HANA Finance, there is only partial support for ALE scenarios. An SAP S/4HANA Finance system cannot serve as an ALE receiver for CO line items. The reason is that FI and CO line items use the same persistence table in SAP S/4HANA Finance. Therefore, the CO line items cannot be posted alone without the FI line items they belong to. SAP does not provide a check to determine if this scenario is used in the system. You have to check this manually. ALE scenarios for the distribution of CO master data, such as cost centers, continue to be supported. Perform closing for periodic asset postings (with program RAPERB2000) You perform this step if you are using Asset Accounting. Execute the periodic depreciation posting run (with program RAPOST2000). 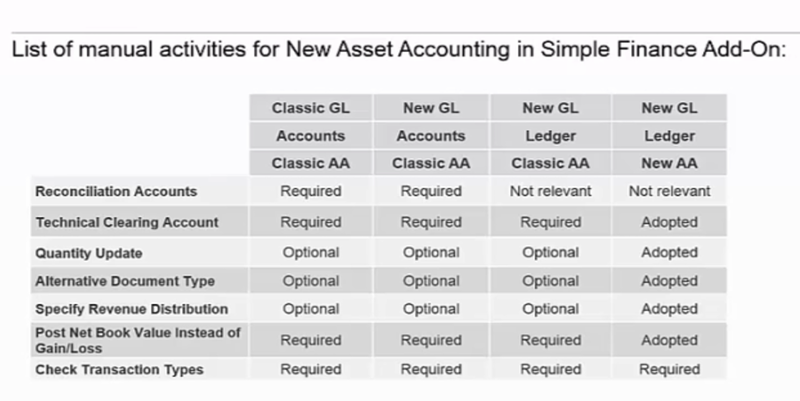 You perform this activity if you are using classic Asset Accounting, new Asset Accounting, or the SAP Simple Finance add-on 1.0. Check for update terminations in your system and correct any you find. Make sure that all held documents have either been posted or deleted. To post held documents, use transaction FB50, for example. In the menu for the transaction, choose Edit Select Held Document. To delete held documents, you can use program RFTMPBLD. If you are already using account-based profitability analysis, perform a delta upload to SAP BW for all account-based CO-PA Data Sources for which you use the delta method. You perform this activity if you are using classic General Ledger Accounting, new General Ledger Accounting, or the SAP Simple Finance add-on 1.0. The following applies for Asset Accounting: Close all fiscal years except the current fiscal year. Use program RAJABS00 to do this. You perform this step if you have been using classic General Ledger Accounting, and used the foreign currency valuation with function Valuation for Balance Sheet Preparation there. In this case, you have to set the valuation differences in the open items to zero; this means you reset the valuations for all periods in the current fiscal year. Reset the valuations using program SAPF100. This step is required because the foreign currency valuation in new General Ledger Accounting does not take into account the results of the function Valuation for Balance Sheet Preparation in classic General Ledger Accounting. If you do not reset the valuations, this could result in incorrect values. Execute all scheduled jobs and do not schedule any new jobs. Lock the periods in Financial Accounting (program SAPL0F00) and Controlling (Plan/Actual) (program SAPMKCSP). Execute progam RASFIN_MIGR_PRECHECK again to make sure that the prerequisites for Asset Accounting have been met. Lock all users in the system that do not have any tasks associated with the installation or the migration. Once the pre-checks are done, the Basis team will prepare and carry out the Installation and Upgrade. The back- up tables are created for the totals and Index tables, original Index and totals tables deleted, create compatibility views etc. No posting is possible henceforth until the Migration is set to complete. IMG Activity provides step by step instructions to complete the customizing, migration and post migration checks. There is detailed documentation available for each step in the customizing activities. There are certain manual steps needs to be performed in customizing New Asset Accounting. Special attention is required to understand these steps, current configuration and impact after migrating to New Asset Accounting. Data Migration Monitor provides detailed error log. The steps could be stopped and re-run after remediation. Typically, the migration could take from 6 hours to 15 hours depending on size of the transactional data. Due to the time required for migration, the post migration steps could be performed at later time. The postings could be done once the migration. Though the Customizing and Migration is an IMG activity in depth understanding of current system, S4HANA Architecture and understanding impact is very important. It is advisable to go through SAP study material, test concepts and critical scenarios in the Lab System or in SandBox. The S4HANA FIN migration project we just completed had some challenges in implementing Account Based COPA. More than implementing AB COPA we had challenge bringing historical data of the Cost Based COPA. SAP provided excellent support and we were able to sail through swiftly. We also had some issues in the Enrichment step in migration and depreciation calculations. The list of SAP notes that we implemented to resolve these issues. It would be helpful to go thru these notes to be better prepared. This is all for the blog on Migration. Hope it provided some sort of overview on the S4HANA Migration process. I already started another blog on S4HANA Reporting and I am so eager to explore and share my experience with you – its all Blue Ocean, full of opportunities. Please provide your feedback so I could improve writing my next blogs. Appreciate your feedback, Anji. Thank you! Very nice document. Thanks for sharing. I have below doubt, please help. Can you help me in understanding the difference between the net book value and acquisition / production costs (APC) for Revenue Distribution for Fixed Asset Retirement. Please explain difference from end user perspective. In account approach, if I have 5 ledgers (1 LL+4 Non-LL) and two parallel currency (Group Currency and hard Currency). Q1: Do I need to have minimum 7 depreciation area? Q2: Can I use one set of GLs for all depreciation area in AO90? SAP says no. Q3: Can I switch from account approach to ledger approach during migration without any impact? Can you please help me on this and all the house banks status is showing in red. Hi, we get the error below running FINS_MIG_STATUS. Tables tab shows tables like BSEG has entries. Relevant SAP notes could not be found. At least now. Incident is open. Any ideas? Thanks. You have started a migration activity in an empty client. The system has determined that there is no data migration needed. You can skip this activity. If you think there is data to be migrated and this message is wrong, please read SAP note 2447251. We have the exact same issue migration to S4hana1709 …. Did you fix your problem ?